Drafting room of architectural office. 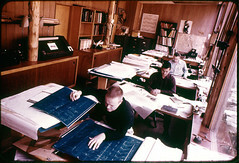 This image is taken from a color slide showing Armstrong's architectural office in the 1950's. The windows at the right are thermal pane glass facing North providing a wonderful, even light for drawing. The individuals depicted in the photograph (starting from the foreground) are Mel Disney, Peter C. Koscher, John H. (Howard) Blair. Armstrong's own desk was located at the far wall. Koscher and Blair were long-time employees of Armstrong's. Photograph (c. 1957) courtesy of Saint Louis architect Mel Disney, an employee of Armstrong's at the time.